Thank you for selecting a Jeep® Wrangler and welcome to our worldwide family. This is a specialized utility vehicle designed for both on-road and off-road use. It can go places and perform tasks for which conventional two-wheel drive enclosed vehicles were not intended. It handles and maneuvers differently from many passenger cars both on-road and off-road, so take time to become familiar with your vehicle. Before you start to drive this vehicle, read the Owner’s Manual. Be sure you are familiar with all vehicle controls, particularly those used for braking, steering, transmis­sion, and transfer case shifting. Learn how your vehicle handles on different road surfaces. Your driving skills will improve with experience. When driving off-road or working the vehicle, don’t overload it or expect it to overcome the laws of nature. Always observe federal, state, provincial and local laws wherever you drive. As with other vehicles of this type, failure to operate this vehicle correctly may result in loss of control or an accident. Be sure to read "On-Road/Off-Road Driving Tips" in this manual. Utility vehicles have a significantly higher roll over rate than other types of vehicles. This vehicle has a higher ground clearance, higher center of gravity, and narrower track than many passenger cars. It is capable of perform­ing better in a wide variety of off-road applications. Driven in an unsafe manner, all vehicles can be caused to go out of control. Because of the higher center of gravity and the narrower track, if this vehicle is out of control it may roll over when some other vehicles may not. Do not attempt sharp turns or abrupt maneuvers or other unsafe driving actions that can cause loss of vehicle control. Failure to operate this vehicle safely may result in an accident, roll over of the vehicle and serious injury or death. Because of its open-body construction, your vehicle offers less protection than closed vehicles in the event of an accident. Failure to use driver and passenger seat belts provided is a major cause of severe or fatal injury. In fact, the U.S. government notes that the universal use of existing seat belts could cut the highway death toll by 10,000 or more each year, and could reduce disabling injuries by 2 million annually. 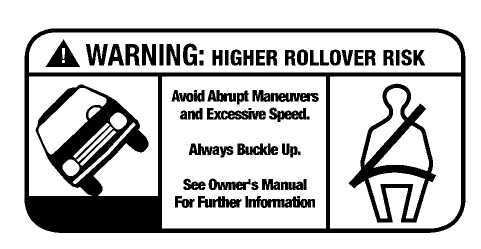 In a roll over crash, an unbelted person is significantly more likely to die than a person wearing a seal belt. Always buckle up. Although your vehicle may be equipped with a soft top or optional hard top to give the occupants protection from the weather, these tops do not offer structural protection in the event of an accident and do not change the open-body characteristic of the vehicle. Even though your vehicle has a sport bar and side bars for some extra protection, it is a truly open vehicle-there is no structural integrated top and it has low sides and a folding wind-shield. Many of these vehicles do not have fully enclosed hard doors. Operating this vehicle at excessive speeds or while intoxicated may result in loss of control, collision with other vehicles or objects, going off the road, or overturn­ing, any of which may lead to serious injury or death. Also, failure to use standard seat belts subjects the driver and passengers to a greater risk of being thrown out of an open-body vehicle than out of a closed vehicle in an accident which can result in injury or death. This manual has been prepared with the assistance of service and engineering specialists to acquaint you with the operation and maintenance of your new vehicle. It is supplemented by a Warranty Information Booklet and various customer oriented documents. You are urged to read these publications carefully. Following the instruc­tions and recommendations in this manual will help assure safe and enjoyable operation of your vehicle. NOTE: After you read the manual, it should be stored in the vehicle for convenient reference and remain with the vehicle when sold so that the new owner will be aware of all safety warnings. When it comes to service, remember that your authorized dealer knows your vehicle best, has the factory-trained technicians and genuine Mopar® parts, and is interested in your satisfaction. Engine exhaust, some of its constituents, and certain vehicle components contain or emit chemicals known to the State of California to cause cancer and birth defects or other reproductive harm. In addition, certain fluids contained in vehicles and certain prod­ucts of component wear contain or emit chemicals known to the State of California to cause cancer and birth defects or other reproductive harm. The detailed index, at the rear of the manual, contains a complete listing of all subjects. This manual contains WARNINGS against operating procedures which could result in an accident or bodily injury. It also contains CAUTIONS against procedures which could result in damage to your vehicle. If you do not read this entire manual you may miss important information. Observe all Warnings and Cautions. The vehicle identification number (VIN) is found on a stamped plate located on the left front corner of the instrument panel pad, visible from outside of vehicle through windshield. This number also appears on the Automobile Information Disclosure Label affixed to a window on your vehicle. Save this label for a convenient record of your vehicle identification number and optional equipment. NOTE: It is illegal to remove the VIN plate. Any modifications or alterations to this vehicle could seriously affect its roadworthiness and safety and may lead to an accident resulting in serious injury or death.